As a dog owner, you have tons of responsibilities on your hands. One of the most important is making sure your dog has a healthy diet. The wrong foods can lead to huge problems, including bladder stones, obesity and even diabetes. Dogs are very similar to humans. If you feed them incorrectly, your dog is going to be unhealthy and their lifespan may be decreased. Relying on the best limited ingredient dog food may prove to be a good decision for you and your pooch. 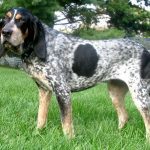 Within this comprehensive guide, you will find limited ingredient dog food reviews and more about these foods in general. 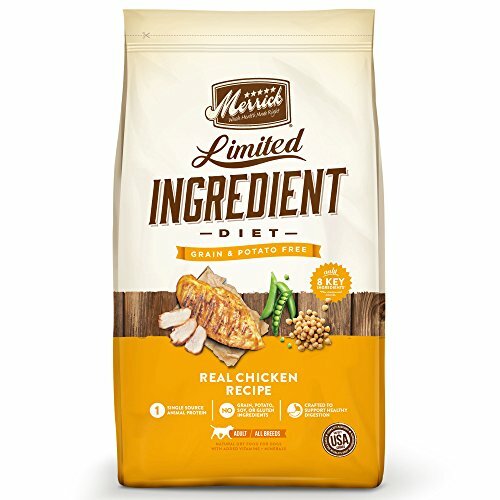 1.1 What Is Limited Ingredient Dog Food? 1.2 When Can A Natural, Limited Ingredient Diet Help? 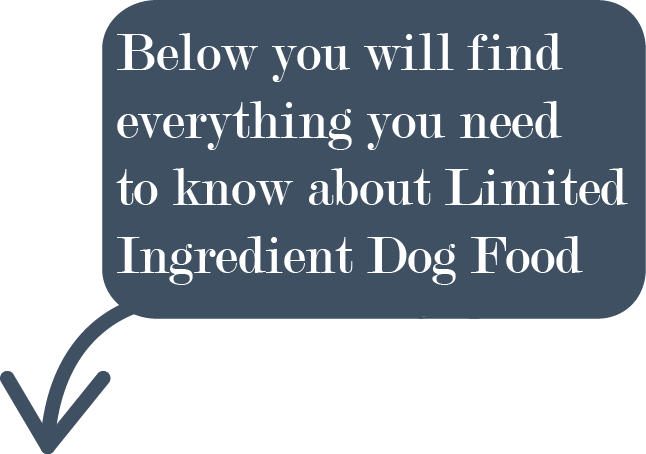 1.4 What To Look For When Choosing A Limited Ingredient Dog Food? 1.5 If It Is So Limited, Is It Enough For My Dog? First and foremost, you should take the time to better familiarize yourself with the best limited ingredient food for dogs. What is this food all about and how does it differ from conventional dog foods? As the name suggests, these foods are made with fewer ingredients than the alternatives. Some companies will only utilize two ingredients to make their foods. In general, these foods will contain just a single protein and a handful of carbohydrates. Usually, these foods will be free of grain. Protein may be provided from novelty sources, such as game meats. Instead of using a lot of byproducts, the limited ingredient dog food will contain a larger quantity of complex carbohydrates. Therefore, the limited food may actually be better nutritionally than the alternatives. When Can A Natural, Limited Ingredient Diet Help? 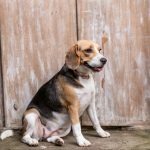 While it is possible to make the transition to a limited ingredient diet as a precaution, many dog owners do so for a specific reason. For instance, they may be looking for a good limited ingredient dog food for allergies or sensitive stomach. If your dog suffers from specific health issues, there is a good chance that a limited ingredient food will help. In fact, these foods are often provided as a temporary way to alleviate many health problems. If your dog is experiencing vomiting, diarrhea or weight loss, you should definitely think about making the switch. The best limited ingredient dry dog food can also help you diagnose allergies. By monitoring your dog’s intake more closely, you’ll have little to no trouble finding out what they’re allergic to. So, why would anyone want to switch their dog to a limited ingredient diet? In actuality, the benefits are enormous, so there are plenty of reasons to make the switch. This type of dog food is also considered to be hypoallergenic, what implies a very slim chance that they’ll cause allergy symptoms. These foods are also free of fillers. Fillers contain very few nutrients and they’re only added to foods to make your dog feel full. It is widely believed that fillers may be the root cause of many health problems. Therefore, getting rid of them can make a huge difference. What To Look For When Choosing A Limited Ingredient Dog Food? When looking for a good limited ingredient food for your pooch, it is pertinent to know what to look for. If the food doesn’t have the right ingredients, your dog may not receive the vitamins and minerals needed to thrive. First and foremost, you should make sure that the food contains only five to eight ingredients. Unfortunately, many companies label their foods as limited ingredient, despite containing many more ingredients. Be sure to stay away from these brands. Read the back label thoroughly. Make sure that the ingredients contain a single source of protein. It should contain several sources of carbohydrates. Check out the guaranteed analysis panel to ensure that the product has a sufficient amount of nutrients for the dog. Always take the time to read limited ingredient dog reviews as well. And finally, you should always choose a reputable manufacturer. If It Is So Limited, Is It Enough For My Dog? Limited ingredient diets are becoming increasingly popular. But, are they actually safe for your pooch? The answer is yes. In fact, these foods are often prescribed by veterinarians. They contain all of the minerals and nutrients needed for your dog to thrive, but they cut out all of the unnecessary and potentially harmful byproducts. Be sure to consult with your vet before making the switch. They’ll know what is best for your pooch! If you are on the market for a nutritious, tasty dry dog food with limited ingredients, you should look no further than Wellness Simple Natural. This dog food is formulated to provide canines with a limited ingredient diet that is easy to digest. This formulated diet contains everything needed to keep your dog healthy and omits ingredients that could potentially trigger allergic reactions and adverse effects. The pancreas excretes enzymes that help the body digest gluten. Dogs with “gluten-induced enteropathy,” known as “celiac disease” in humans, are sensitive to gluten. While most canines tolerate grains, such as wheat, quite well, some owners feel more comfortable omitting it from the diet. Whatever the case may be a limited ingredient diet is ideal for all canines. 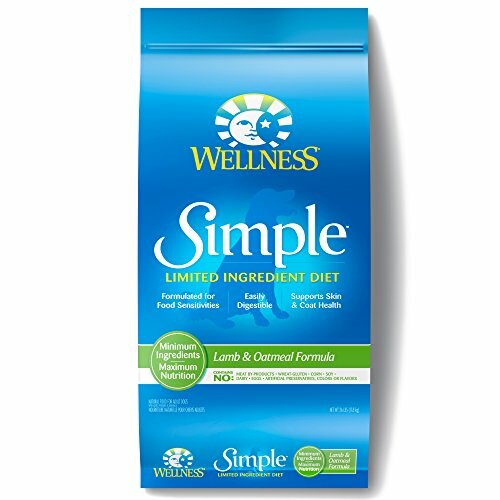 Wellness Simple Natural does not contain gluten, artificial additives, fillers or wheat. When your canine consumes this food, you will be ensured that he will not experience any adverse side effects. Wellness Simple Natural is comprised of a variety of all-natural ingredients, which have been proven to provide more nutritional value than commercial varieties. The ingredients found in this dog food are not only easily digestible, but also provide a broad array of health benefits to prevent many canine cancers and other diseases. This formulated all-natural diet does not contain unwanted or harmful ingredients, such as artificial ingredients, fertilizers, hormones or pesticides. Wellness Simple Natural Limited Ingredient Dry Food is ideal for canines with gluten sensitivity and food allergies. The formulated diet contains nutritious value to keep your canine healthy and active. This is one Wellness brand dry dog food that your pet will love and enjoy. Dogs with food allergies and sensitivities must consume a restricted diet, with high nutritional value. This is why owners turn to Nature’s Variety Instinct Limited Ingredient Dry Dog Food. 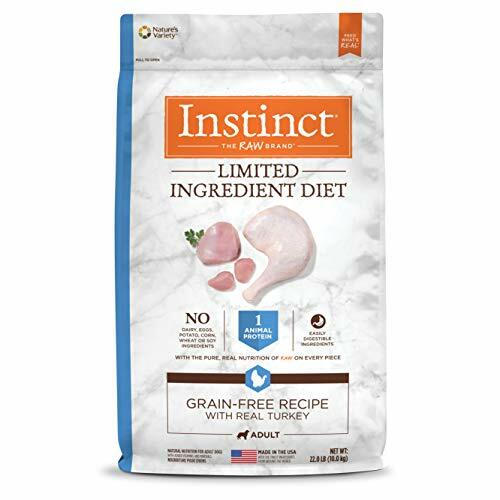 This formulated diet is designed to provide all breeds of all ages healthy, digestible and delicious foods, without the ingredients that could potentially cause harm. While most dogs tolerate grains well, others are not so lucky. Such dogs will experience bloating, constipation, gas, diarrhea and skin rash after consuming grains. To avoid these side effects, grains must be omitted from the diet completely. Nature’s Variety Instinct is a grain-free dry dog food that contains the finest ingredients available. The formulated diet does contain easily digestible ingredients, including protein, which is required for healthy bones, skin, muscles and cartilage. As with any other product manufactured in the United States, Nature’s Variety Instinct Dog Food is of the highest quality. The brand complies with the strict Federal Trade Commission rules and regulations. So, when you purchase this dog food, you are investing in a premium-grade product that is guaranteed to fit the description provided by the manufacturer. Nature’s Variety Instinct is made from grass-fed meat, which is a rich source of conjugated fatty acids, with a low-fat content. Each bowl of dry food will provide heart health benefits that are not provided by traditional meats. Your dog will consume every kibble in their bowl happily. Nature’s Variety Instinct Limited Ingredient Dry Dog Food is the preferred brand for many dog owners. The formulated diet provides adequate nutritional value, without all the harmful ingredients known to cause canine cancer and digestive issues. The protein content will ensure healthy bone and muscle development and health. Your dog is guaranteed to love this dog food, even if he/she is a finicky eater. As you probably already know, Merrick is a brand that you can trust. The company almost always delivers high-quality foods that are nutritious and delicious. The Merrick Limited Ingredient foods will make a great choice for many dog owners. It is available in numerous sizes and flavors. This guarantees that it’ll be able to accommodate pretty much all dogs, regardless of breed, size, age or preference. Plus, this food is cooked in the United States with no ingredients from China! Getting your dog to eat a new food can be difficult. This can be simplified with Merrick. The company offers numerous flavors, including chicken, lamb, salmon, turkey, and duck. As long as you know what your dog prefers, you’ll have no trouble choosing a Merrick limited ingredient food that they’ll love. On top of that, the food contains a single animal protein source! Another great thing about the Merrick Limited Ingredient Food is the fact that it is designed to keep your pooch happy and healthy. First and foremost, the recipes will deliver a sufficient amount of Omega 3 and 6 fatty acids. This helps protect your dog’s skin and coat. The recipes also include glucosamine and chondroitin. 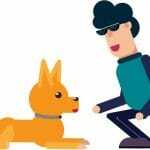 These ingredients are important for keeping your dog’s joints and hips in great shape. You should also know that the Merrick food contains easily digestible carbohydrates. If your dog is suffering from stomach problems, this food may help alleviate their suffering. At the same time, the food doesn’t contain any grains, gluten or corn ingredients. So, your dog will receive only the best of the best! This food is great for dogs with sensitive stomachs and food sensitivities. It is always best to be safe and with Merrick you’ll be able to do just that. There is no doubt that the Merrick Limited Ingredient Food is expensive. Nevertheless, it will prove to be well worth it for most dog owners. The food is very nutritious and it includes the right number of ingredients. Plus, it will protect your dog’s coat, skin, hips and joints. 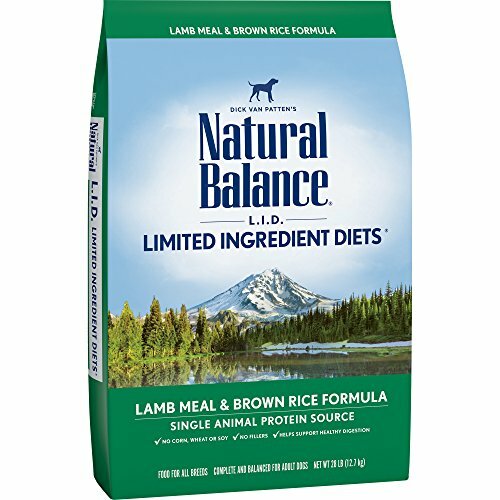 If you’re looking for a delicious dog food that contains limited ingredients, you should definitely check out the lamb meal and brown rice formula from Natural Balance. This specific food is available in various sizes ranging from 4.5 to 28 pounds. This ensures that you’ll be able to experiment with it, before fully committing to it. It is also available in numerous styles, making it suitable for small and large breed dogs. It is also great for dogs of all ages. While you will definitely want limited ingredients, you’ll also want to make sure that your pooch has all of the necessary vitamins and minerals. This is where the Natural Balance brand excels. This food delivers complete and balanced nutrition, which is suitable for all stages of your dog’s life. Another great thing about Natural Balance is the fact that is does not contain any artificial ingredients. It is free of artificial colors, flavors and preservatives. You can rest assured knowing that your dog is not going to be negatively impacted by any of these harmful ingredients. 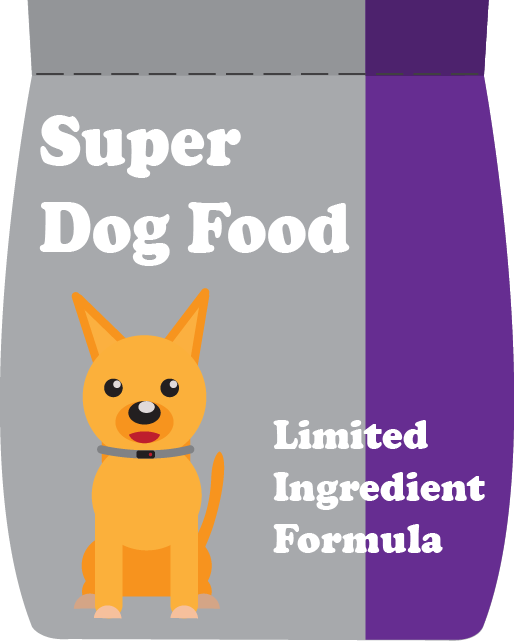 This specific limited ingredient dog food Natural Balance contains the best ingredients possible. It only contains a single protein source, lamb meal. It contains brown rice and canola oil. The oil will provide your dog with plenty of Omega 3 and 6 fatty acids. 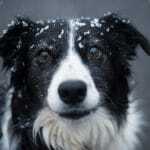 This is vitally important for keeping their skin and coat in tiptop condition. Truly, the Natural Balance Limited Ingredient Dog Food is a great choice for many dog owners. It is available in numerous sizes, so you can experiment before you commit. Plus, it contains superior ingredients and can help maintain digestive health. For the price, it is definitely a good investment. Blue Buffalo is a pretty reputable brand and you’re probably already familiar with the company. After all, they’re frequently on television. Is the company’s limited ingredient formula dog food right for you? The food is available in several varieties, including a grain-free turkey & potato recipe, salmon & potato recipe, and a lamb & potato recipe. The options are plentiful. This ensures that you’ll be able to find something that your dog will actually eat. Additional details will be provided below. It is nice to know that BLUE Basics is indeed grain and gluten free. The food does not contain any of these ingredients whatsoever. Your dog only gets the best. You’ll be able to rest assured knowing your dog is getting the nutrients he or she needs, without having to worry about possible sensitivities to grain or gluten. This dog food is truly a limited ingredient food that you can depend on. By reading limited ingredient dog food reviews, you will find that most consumers agree. If your dog has a sensitive stomach, you’ll always want to stick with carbohydrates that are easy to digest. The BLUE Basics is a good option. It contains peas and potatoes. Both of which can be digested very easily. On top of that, this food also includes pumpkin and pea fiber. This combination can help support gentle digestion and smooth your dog’s belly. 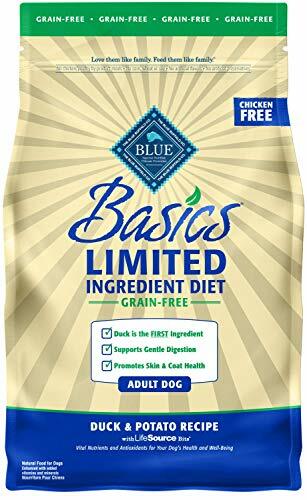 All in all, the BLUE Basics Limited-Ingredient Formula Adult Dry Dog Food is definitely a good investment. It works exceptionally well for the intended purpose and it’ll provide your pooch with everything they need. Unfortunately, some picky dogs might not like the smell and taste.